Probably my go-to non athleisure outfit these days, or some form of it (occasionally swapped for my wool coat depending on weather and occasion). But a solid skinny jean, leather boot and plain tee are such a great slate to build any cold weather outfit off of, that it’s more or less my base combination even through this last trimester. I’ve been slacking heavy on outfit content part because pregnancy and just finding myself not only uninspired to get shots but more so, running around with so much extra to do and with our recent move being back to a place of cold temps, it’s made for getting outside to snap shots a hell of a lot harder. 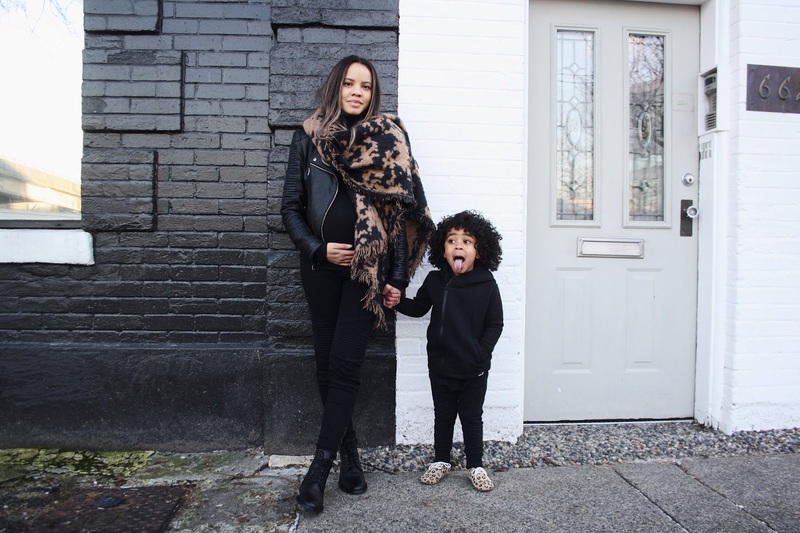 That being said, slow as it might be, I’m hoping to share at least a handful of style posts before baby’s arrival and the tips that have gotten me through almost an entire pregnancy while maintaining my consumer preferences. These jeans are courtesy of Pink Blush Maternity, and part of the 30 piece curation we came up with together. You can find the entire selection, linked below. This post is in partnership with Pink Blush Maternity. More on my work with the brand, in this post.